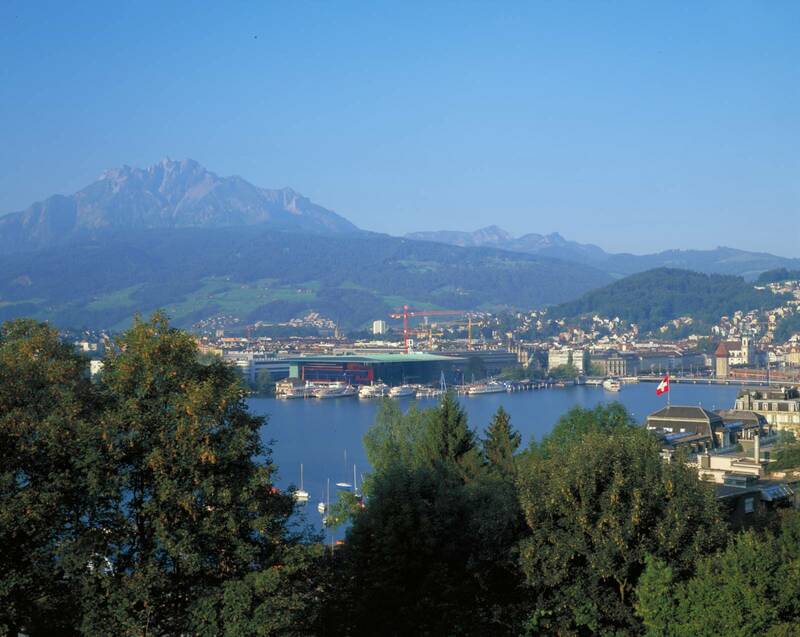 Lucerne sits at the end of a lake : the two parts of the city face each other across the water and look to the mountains beyond. The surrounding landscape, whether in summer or winter, creates a rich visual backdrop to the historically varied existing architecture and dense urban fabric of the city. 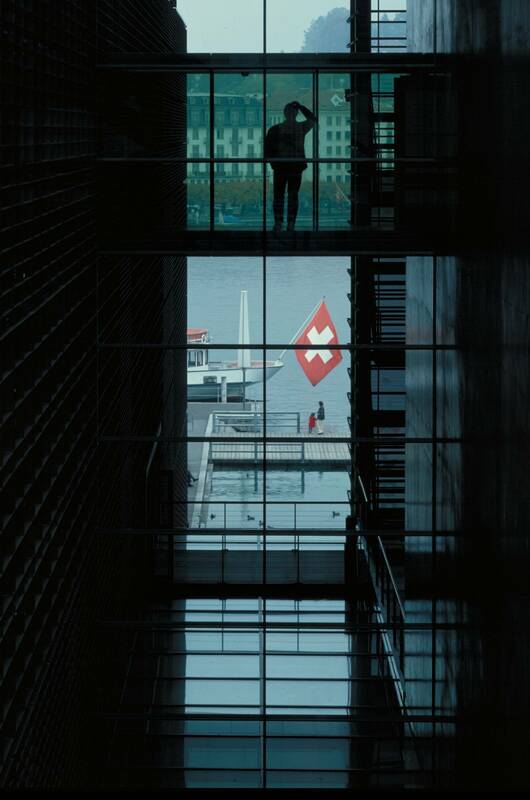 A new building had therefore to begin from what Nouvel termed “a principle of inclusion”, in which the main element was the lake itself. If the building could not broach the shoreline, the lake would come to the building. 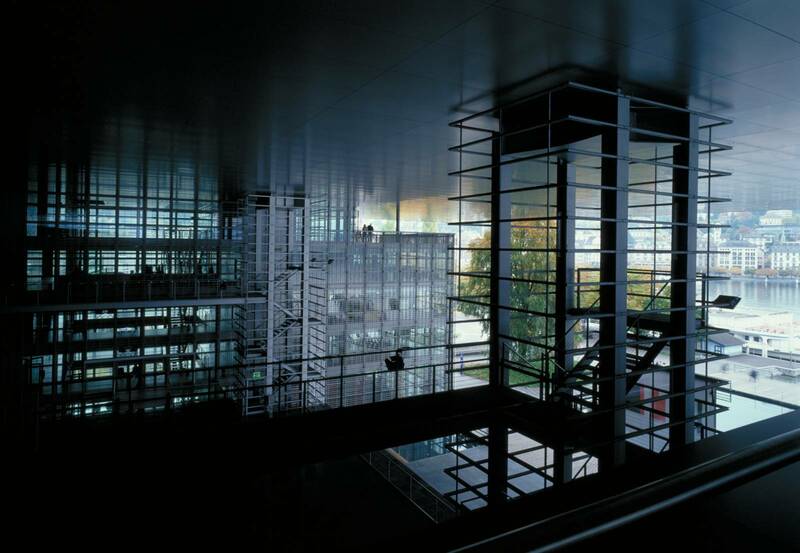 Thus the backbone of the building is set away from the lake, and the three principal elements (the two concert halls and the conference center) reach out from the spine towards the lake, divided from each other at ground level by strips of water, a “water garden” in Nouvel’s term, crossed by pedestrian bridges. The museum is situated above the western building, the conference center. 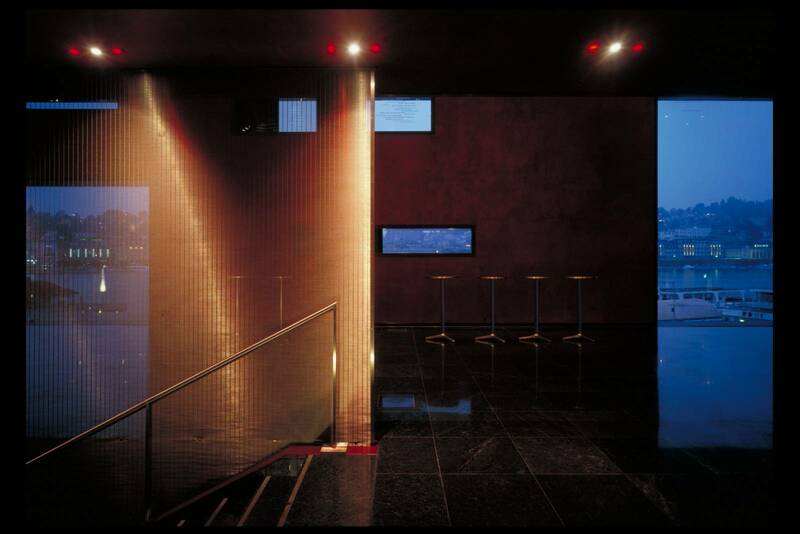 These elements are unified under an immense sloping copper roof, which projects, unsupported, twenty meters from the main façade, and landmarks the building from the opposite side of the lake. 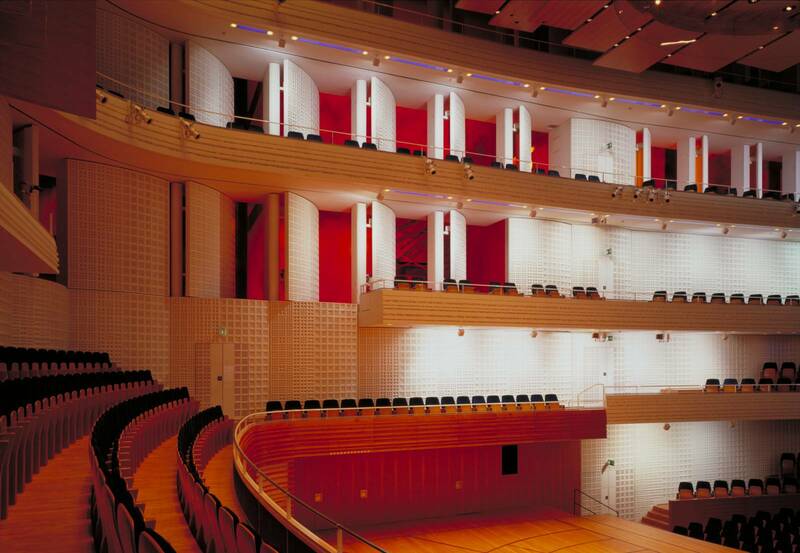 The musikhalle was retained and used while the spine and largest concert hall were being constructed. 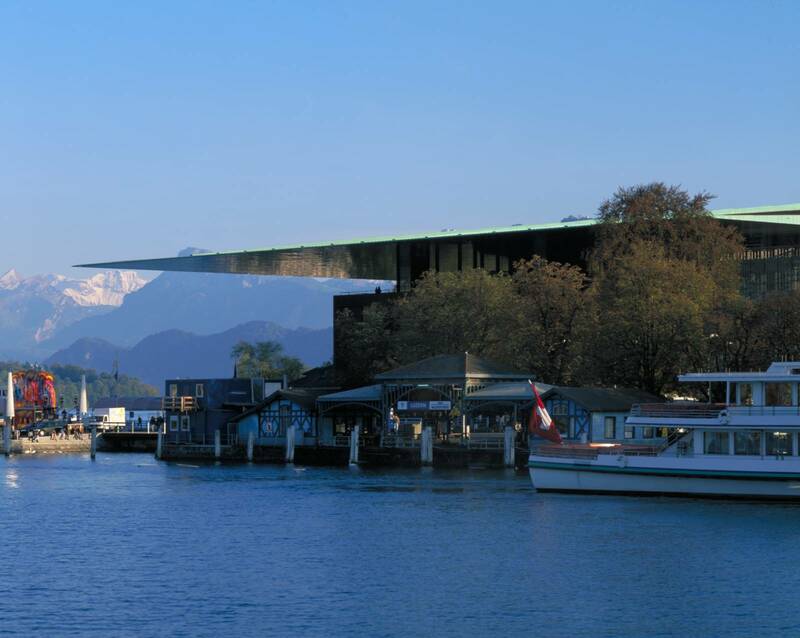 What Nouvel will have achieved in Lucerne is not only a technical tour de force. He gives each of the elements of the building its own identity within a whole that is both complete in and of itself and integrated into its very special context. In his own words, “the architectural solution has to be harmonious, sensible, intelligent, and inclusive.” Nouvel worked with the American acoustic engineer Russell Johnson and his team at Artec in New York on the acoustic specifications. The concrete doors, faced with plaster, are on motor-driven hinges, and a computerized control system allows each door to be positioned exactly between fully closed and open to 90 degrees outwards into the echo chamber, thereby subtly modifying the acoustical effect according to the wishes of the conductor or the demands of the music being performed. 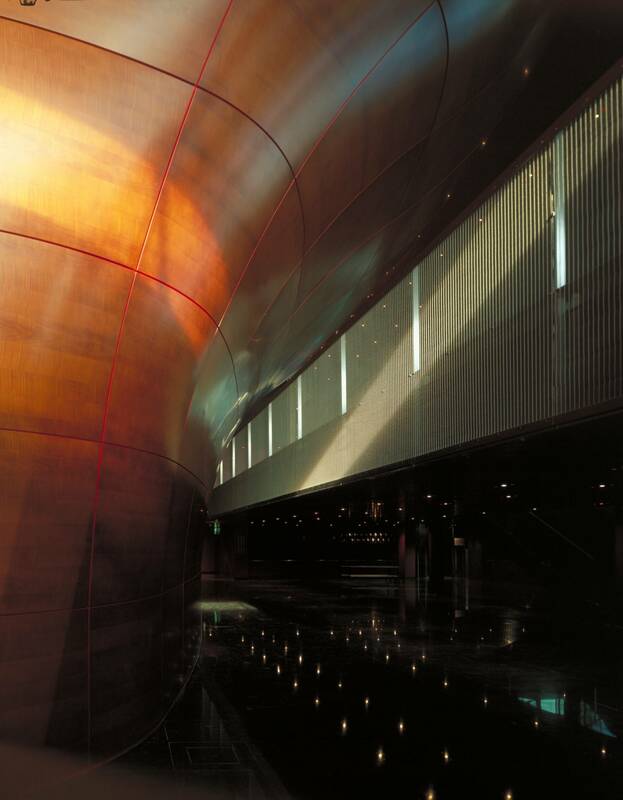 For the special lighting effects, Nouvel called on the internationally famous lighting designer Ingo Maurer, while the paint effects were created by Alain Bony, who works regularly with Nouvel and who also advised on the external color scheme. The new interior design, with its strong monochrome patterning streaked by lines of red from the doors and muted by the blue seating, is a jewel: calm but rigorous, welcoming, and relaxed. The different sizes of patterning on the façades of the balconies and on the walls and doors recall the varied urban and natural densities of the surrounding city and country. 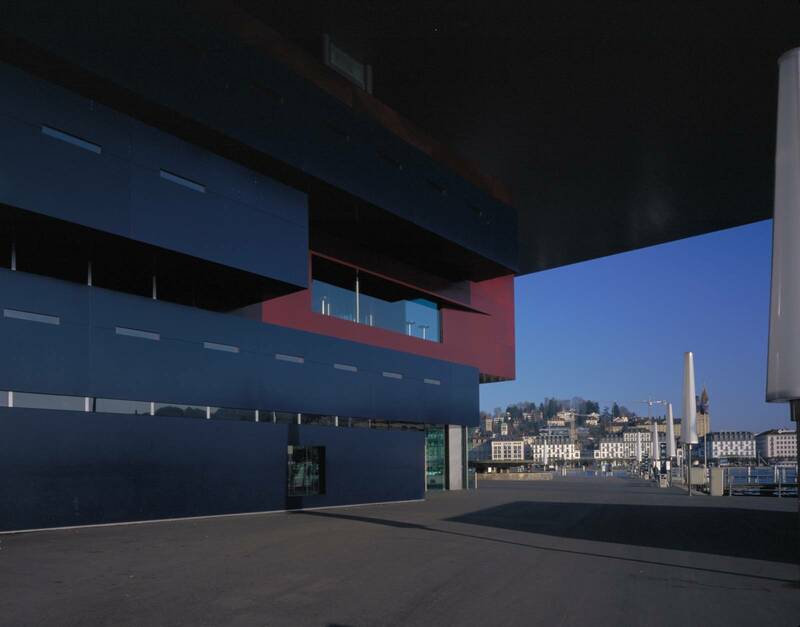 What Nouvel has achieved at Lucerne is a masterpiece of synthesis and expression, responding to the needs of a visually dense site yet creating a wholly contemporary building whose function is clearly readable through its bold subtleties.